A total of 31 Filipino migrants in South Korea attended the free workshop on Balloon Twisting and Decoration last June 25, 2017 at the Philippine Embassy in Seoul, South Korea. Some of the delegates like the "Nagkakaisang Pilipino" (NAPIL) Filipino community headed by Membership Committee Chair Ms Cherilyn Abecia (Korean name : Cherin Kim) and the Secretary Ms Chona Go came all the way from Jeju Island with 5 Filipino EPS workers just to attend this rare event. Ms. Mila Nuval Pena, OWWA Director to South Korea appreciated the eagerness of the attendees to learn the skill especially the Jeju delegates. 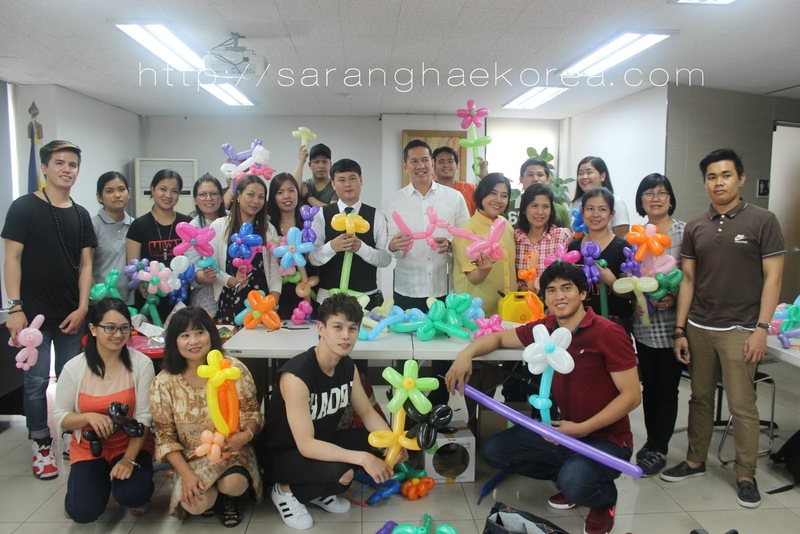 They were enthusiastic to learn the skills and they are also planning to teach what they learned from the workshop to other Filipino migrants in the Jeju island. Mr. Arche Sapida, an EPS worker in Korea, was the trainer of the said workshop. He generously shared what he knows about the art of balloon twisting and decoration to the attendees. It's his last time to do it here in South Korea because he shall be going home for good after working 4 years and 10 months. He patiently demonstrated the different kinds of decoration using the balloons. The attendees on the other hand were so eager to acquire this skill as they tried their best to apply what they learned from Mr. Sapida using the materials provided by OWWA. 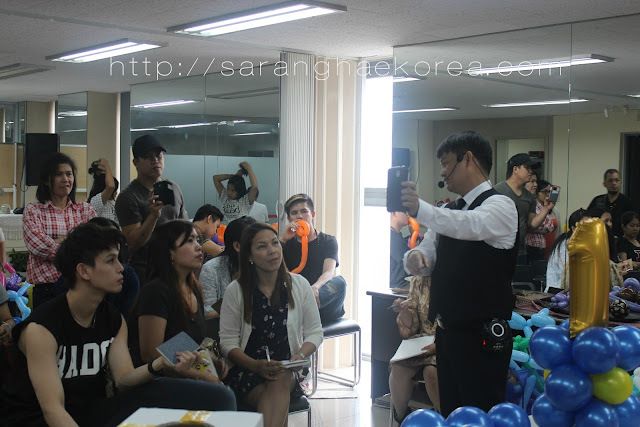 In the middle of the workshop, The Philippine Ambassador to South Korea Hon. Raul Hernandez also joined in the fun and learning as he checked on the progress of the workshop. He expressed his appreciation to everyone who attended the event and encouraged to make use of what we learned from the workshop in our future endeavors. At the end of the workshop, the OWWA Director Ms. Mila Nuval Pena awarded the certificate of accomplishments to the attendees. She and the Labor Atache Ma. Luz Talento encouraged Filipino migrants in Korea to become good at work in Korea but also emphasized that everyone must become better when we go back for eventual reintegration. This kind of workshop is one way to prepare ourselves in going back to the home country and become ready to maximize economic gains from overseas employment through going into business ventures. This could be the last workshop for Balloon Twisting and Decoration but OWWA has future training programs for those who are interested to learn new skills. If you want to know more about this and the benefits you can get for being a member of OWWA, you can always visit the office at the Philippine Embassy in Seoul or watch out for some announcements on Social Media and on this blog. Take advantage of these learning opportunities and maximize your benefits for being an OWWA member.